Your hair, just like your skin, is susceptible to the natural ageing process. As you get older, you’ll gradually begin noticing significant differences in the colour, texture, thickness, health and manageability of your hair. If your hair has lost a little thickness and vibrancy over the years, don’t worry. Try these editor-approved tricks to add volume, boost shine, restore colour and strengthen fine hair at any age. 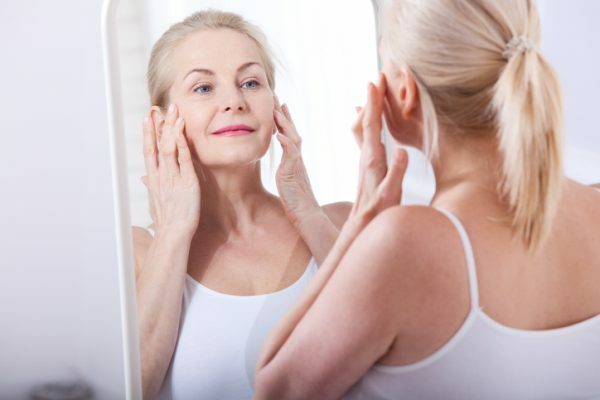 Dermatologists report that in our late 30s and 40s, individual hairs will start to grow in finer. Luckily, there are short- and long-term fixes to help add volume and thickness to ageing hair. Work a pea-size amount of Viviscal Gorgeous Growth Densifying Elixir into damp hair, then blow dry or air dry and style as usual. This body-boosting treatment makes fine and ageing hair look thicker and fuller. Another hairstylist-recommended solution? The right haircut, of course! For women with straight hair, stylists recommend a blunt cut to make hair look thicker. For curls, add layers to help them look bouncy and full. Half of all women will experience some kind of hair loss by the time they hit age 50, according to the North American Hair Research Society. There are four stages that hair goes through in the hair growth cycle—a growing phase (anagen), a regression phase (catagen), a resting phase (telogen) and a shedding phase (exogen). As you get older, your hair spends more time in the resting phase of the cycle, which means you’re shedding hair faster than it’s growing back. Unlike male hair loss, which usually starts as a receding hairline and thinning crown, female hair loss occurs as a gradual thinning all over your scalp. In fact, many dermatologists advise that women often don’t immediately notice their hair coming out in the shower or in your brush. But then, over time, more of your scalp becomes visible. Some of us may have drawn the short genetic straw when it comes to hair loss. In that case, age-related hair loss may be unavoidable. For other women, a number of other factors could be taking a toll on hair growth. 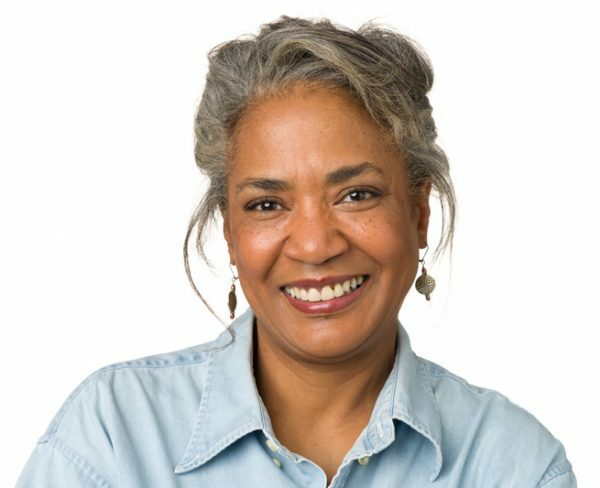 For some, the hormonal fluctuations of menopause or nutritional deficiencies may be the culprits. Other very common causes of women’s hair loss are underactive thyroid and stress. Hair products also can affect how thinning, ageing hair looks. The wrong shampoo and conditioner can make ageing hair loss more apparent by weighing hair down or over-drying ageing hair that’s already more fragile and prone to damage. Switch to lightweight, nourishing shampoo and conditioner formulas designed to make thinning hair look thicker, such as Viviscal Gorgeous Growth Densifying Shampoo and Conditioner. As an added bonus, these products are fortified with hair-strengthening nutrients to improve the condition of your hair on the outside. One long-term drug treatment is over-the-counter minoxidil, which stimulates hair regrowth. However, once you begin taking minoxidil, you need to commit to taking it long-term, because when you stop taking it, your hair regrowth will reverse. If you believe your hormones have become imbalanced with age, it’s best to see your primary care doctor, gynaecologist or an endocrinologist to get to the bottom of the issue. Reduce stress by relaxing, getting enough sleep, and turning off TVs and all other devices with screens a couple of hours before bed. If you watch TV in the evening, stay away from the news, or more violent or disturbing, shows after 6 p.m. to ease into a stress-free mindset before bed. Avoid toxic products, foods and toxins in general, as the thyroid is especially vulnerable to toxins. As you age, production of oil glands on your scalp may slow down. That’s why ageing hair may feel drier and look less glossy. Work a drop of hair oil or shine-enhancing serum into your palms, then run it through damp hair beginning at the ends, as these are usually driest. Avoid your roots as adding oil at the scalp could make hair look greasy. You can do this on dry hair too on days when you’re not shampooing. Apply a deep-conditioning coconut oil mask to hair once a week to boost shine. Rub a scoop of coconut oil between your hands to warm it up and then spread it on the bottom half of dry hair. Leave the oil on your hair for at least one hour, and then shampoo it out with a mild shampoo like Viviscal Shampoo. Coconut oil not only conditions but experts believe it may even help to decrease protein loss from hair strands. Changing your diet can also boost shine and softness in ageing hair. The best addition to your diet? Eat more fatty fish such as salmon or tuna, which are rich in omega-3 fatty acids, substances shown to give hair more shine, thickness and lustre. Tip: If you don’t like fish, you can get more omegas in your diet from plant-based sources such as flaxseeds or walnuts. You see those pesky greys reappear between colourings, and your natural hair colour fades over time. 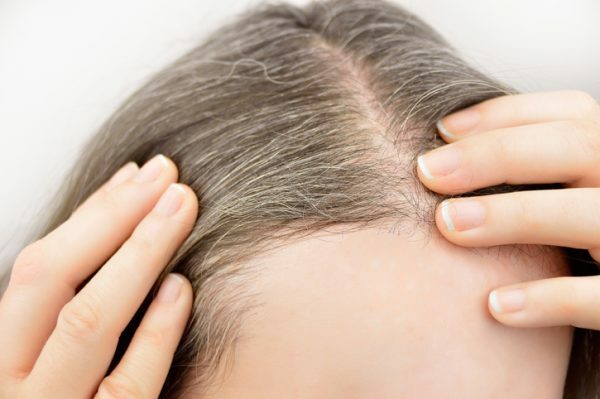 If you’re just starting to see grey hairs, it’s okay to pluck them. Despite that old myth, it won’t make the greys grow back in any faster. Often, if we pluck a grey hair and then notice more coming in, we just assume there’s a correlation. In fact, It’s fine to pluck an occasional grey, but beware of waging war on your tresses — too much plucking can weaken hair, making it more susceptible to split ends and breakage. If you have a significant amount of greys, you can use a temporary root touch-up spray such as Toppik™ Root Touch Up Spray to cover roots between hair appointments. Let’s face it, everyone’s ageing hair eventually will go grey. But using permanent hair colour helps minimize the time between return trips to the salon. And if you’re dyeing your hair at home, choose an at-home dye that is specifically designed to cover greys. Or avoid the repeated colourist visits altogether and allow your hair to go grey naturally. To enhance your silver locks, shampoo hair once a week with a purple shampoo. This type of shampoo will help increase shine and prevent brassy tones. You can find a good purple shampoo at most salons. Because ageing hair grows in finer over time, strands can be more fragile and more prone to breakage while styling or brushing. This could lead to damaged-looking hair, split ends and less volume overall. Go to your stylist every 6-8 weeks for regular trims. This will help remove those frayed, split ends, and will keep your hair looking its healthiest and thickest. For an even quicker, more temporary fix for split ends, apply a styling cream formulated for breakage to your ends daily. You can also add volume to ageing hair strands with a fortifying serum such as Viviscal Elixir. Its lightweight formula has keratin, biotin, zinc and a proprietary complex called Ana:Tel™, to make hair look thicker and fuller. Apply the leave-in elixir to damp or dry hair daily and style as usual. You must know this by now but one of the biggest culprits behind damaged, breaking hair is heat! Cut back on your use of blow-dryers, straighteners and curling irons. If you must use heat tools, try a lower temperature setting. Use Viviscal Shampoo and Conditioner, which are formulated with ingredients to make ageing hair thicker and therefore easier to style. These products also help add strength to the outside of strands making ageing hair less prone to breakage. For extra damage prevention, avoid brushing or combing wet hair, which is when it’s extra fragile and prone to breaking. Avoid bleaching your hair, which can actually make strands more porous and inhibit their ability to retain moisture, making them extra susceptible to breakage. Bleaching actually raises hairs’ outer cuticles, allowing bleach to fully penetrate the hair strand. And dermatologists have found that repeated bleaching may actually permanently raise cuticle scales, allowing a rapid and continuous loss of moisture. Yikes! 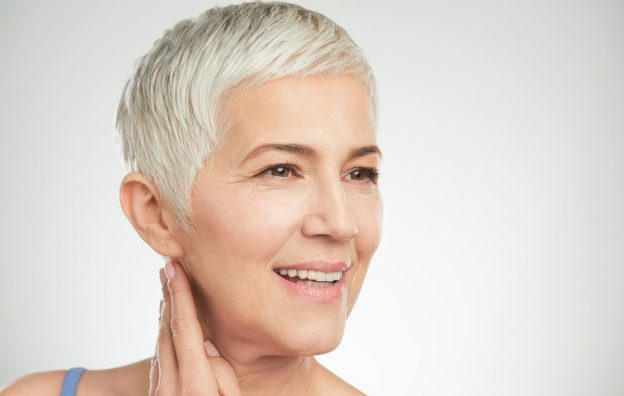 While we can’t completely escape the signs of ageing, these tips and tricks will help to disguise some of the most noticeable signs of ageing hair.